Most of the increase is the result of expecting retirees to live longer and a change of actuarial methods aimed at getting to full funding sooner. More rate increases are expected for another four years. The proposed rates that the California Public Employees Retirement System board will be asked to adopt next week are a little lower than expected in the new state budget proposed by Gov. Brown in January. His Finance department expected the annual payment to CalPERS for state workers to be $5 billion ($2.9 billion from the general fund) in the new fiscal year, up from $4.5 billion this year. The five state worker retirement plans as of June 30, 2014, had an average of 72 percent of the projected assets needed to pay future pension obligations, up from 66 percent the previous year due to strong pension fund investment earnings. The debt or “unfunded liability” (pension obligations over the next 30 years not covered by the projected assets) dropped to $43.3 billion as of June last year, down from about $49.9 billion in the previous year. Part of the rate increase results from the governor’s recent pension reform. Most state workers are required to pay 50 percent of the pension “normal” cost,” the rate for the pension earned during the year excluding the debt from previous years. State workers contribute about 6 to 11 percent of their pay to pensions. The reform requires that money the state saves from the reform’s higher employee contributions be used to help pay off the unfunded liability, rather than lower state rates. As a result, the actuarially required payment to the state next fiscal year is $4.75 billion. But to comply with the reform’s directive on savings from higher employee rates, the actuaries recommend a total state rate of $4.9 billion. CalPERS state rates have been on a roller-coaster the last 15 years. During a booming stock market boom in the late 1990s, CalPERS had a surplus with a funding level of about 135 percent of the projected assets needed to pay promised pensions. The CalPERS board dropped the state rate, $1.2 billion in 1997, to a relative near zero: $159 million in 1999 and $157 million in 2000. This is called a contribution “holiday,” which is banned under the new pension reform. The CalPERS rate jumped to $677 million in 2001 and had reached $2.7 billion in 2007, the eve of destruction. CalPERS had a funding level of about 100 percent then. And the investment fund, expected to pay two-thirds of pensions, was valued at $260 billion. Then the great recession and a stock market crash hit in 2008. And by 2009 the investment fund dropped to $160 billion, and the funding level was an average of about 60 percent. Now six years later, after an historic bull stock market and big rate increases, the CalPERS investment fund is valued at $303 billion and the state worker funding level average as of last June is still only 72 percent. 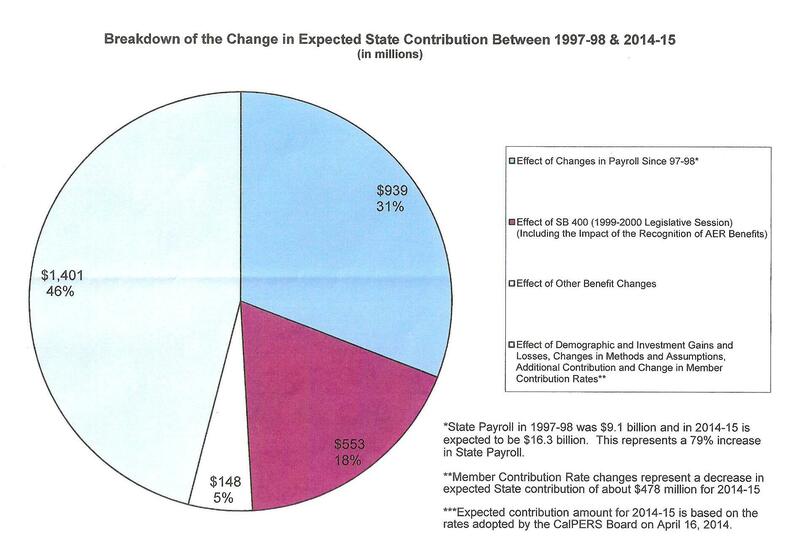 As critics frequently point out, CalPERS sponsored a major retroactive state worker pension increase, SB 400 in 1999. Retirees received pension increases of 1 to 6 percent, depending on the amount of time they had been retired. Importantly, the state worker bill also authorized the “3 at 50” formula for local police. Critics say the formula is now widespread among local police and firefighters, resulting in “unsustainable” pension costs and squeezing funding from other programs. A recently updated CalPERS chart shows that SB 400 has not had the big impact on state rates that critics might expect. In a breakdown of the state contribution changes between 1997 and 2014, SB 400 accounts for about 18 percent of the increase. Other benefit changes caused 5 percent of the change. Most of the rate change, 46 percent, was due to investment gains and losses and changes in demographic assumptions, actuarial methods and contributions. Employee contributions reduced the state contribution about $478 million this fiscal year. An increasing state payroll accounts for 31 percent of the rate change during the period. The state payroll, $9.1 billion in 1997, increased to an expected $16.3 billion this fiscal year. The governor’s pension reform gives new state workers hired after Jan. 1, 2013, lower pension formulas. They have to work about four years longer to get the same pension provided by the old formulas. The old Highway Patrol formula, “3 at 50,” is higher than the old formula for most state workers, “2 at 55,” for a reason. The Highway Patrol does not get Social Security, unlike most state workers, and they often retire earlier due to the physical demands of their work. Among the five state worker retirement plans, the Highway Patrol has the lowest funding level and the highest contribution rates. The Highway Patrol funding level last year was 64 percent, below the 72 percent for most state workers. The Highway Patrol employer rate for next year is 46.7 percent of pay, nearly twice the rate for most state workers, 25 percent. By 2019 the Highway Patrol rate is expected to increase by 5.9 percent of pay, compared to 3.5 percent for most state workers. State workers are about 30 percent of the 1.1 million active and inactive CalPERS members. The largest group is non-teaching school employees, 39 percent. Another 31 percent are in local government. Actuaries are recommending a small CalPERS rate increase for schools, $111 million to a total of $1.3 billion. The employer contribution rate would be 11.847 percent of pay, up from 11.771 percent. The schools have a funding level of 86.6 percent, up from 80.5 percent, and the debt or “unfunded liability” is $8.8 billion, down from $12 billion. CalPERS rate increases for 1,580 local governments, who have 31 percent of the members, are expected later this year. This entry was posted on April 9, 2015 at 7:34 am and is filed under CalPERS, Rates, SB 400. You can follow any responses to this entry through the RSS 2.0 feed. You can skip to the end and leave a response. Pinging is currently not allowed. In light of subsequent events, isn’t it clear that the 135 percent of funding in 2000 was a lie based on a bubble, a lie that Generation Greed used to inflate public employee pensions (and executive pay) and cut taxes? Isn’t that at the heart of what has happened since? And aren’t the current funding levels a lie for the same reason? That’s the game. You get a bubble, and those control our public and private organizations grab money off the top, in secret and unopposed because the serfs aren’t made to pay (at first). When you get a bust, the serfs and younger generations are sacrificed due to “circumstances beyond our control.” Those who cashed in on self dealing give back nothing. The explosion in executive pay, relative to worker pay or dividends paid to investors, was justified by all the “shareholder value” that CEOs created in the 1990s. But it never reverted back to what it had been when the stock market did. Instead, it increased with every bubble. Neither did anyone say “sorry, but we can only pay public employees the pensions they were originally promised.” In fact, subsequent bubbles driven by Federal Reserve interest rate policy have seen more retroactive pension increases, notably this one in New York City. They didn’t know it was a bubble in 2000? How about early 2008? How about right now, with more pension deals and incentives being proposed in NY? In places where the anti-tax wealthy, rather than the public employee unions, dominate politics, the tax cuts were never fully reversed either. Worse, in some places — Illinois in particular — retirement income is exempted from state income taxes, meaning those who benefitted won’t have to contribute anything to the solution. Those who control our institutions benefitted from “mistakes.” Oh well. Now someone else worse off has to pay? That is what has been happening, isn’t it? Your reply doesn’t address my original point, which is there is no documented evidence that SB400 in 1999 was a ploy to boost pensions at taxpayer expense. Your reply instead wanders off to New York. It feels like are using this forum to promote your own web page? Why would there be? It was head we win, tails we lose. You don’t just make a public announcement of that sort of thing. Would that be another mistake? What additional mistakes are coming? Should we be pre-funding them? Are actuaries accounting for them? As I recall, one of the main reasons for SB400 was to reinstate tier one pensions for new employees. Tier two was mandated for all new employees, by the Pete Wilson administration, I believe, in the eighties. Legacy employees were still tier one (2%@60) and all miscellaneous employees hired between mid eighties and 1999 were tier two (1.25%@65). Tier two required no contribution from the employee, but retiring at 65 with 30 years would give 37.5% of final salary, (as opposed to 72.5% for tier one). The NEW tier one for ALL employees resulting from SB400 (2%@55) would pay 75% of salary with 30 years at age 65. I agree with Cal-PERSon, 135 percent of funding in 2000 was not a lie and SB400 was not a nefarious plot to rob the taxpayer. Also, “Generation Greed” and the whole concept of generational equity is a non -starter. Our grandchildren will likely look back on us with pity, not envy. Either way, taxpayers will be paying for it.